From the day the book went out of print, the phone calls and emails started coming into our offices, hopeful of a new edition. Thanks to benefactors who have made it possible, this new edition from the Mises Institute is beautiful, and affordable. from Bucharest The Book that changed my life. from Canada Aren't you convinced yet? Rothbard's analysis of the state is truly devastating for any sort of statist. He does not care what kind of statist you are. Are you a communist, socialist, Keynesian interventionist, neoliberal or minarhist? Then he is against you. Armed with thorough knowledge of revisionist history, sharp economical and philosophical analysis, and clear and concise writing style, you are guaranteed to like this book. Strongest argument for an economy absent of government. also one of the best explanations of the business cycle. i highly recommend it. from USA Amazing. Must read for all Americans. If I had a million dollars to spend on anything, I would buy as many copies of this book as I could, go to a busy section of a city, and hand out one to everyone I saw. This book is that good. In this book Rothbard brilliantly and clearly explains the philosophy of libertarianism, from the concepts of natural and property rights, to why it calls for the complete abolishment of the State (any government), which is inherently immoral and remarkably inefficient and causes much more grief than any of us realize. Rothbard not only describes why government does not work, he writes about the libertarian solution to the majority of the problems we face today. He also addresses and crushes almost every conceivable argument against libertarianism. If you had any doubts that libertarianism could work or thought it was "Utopian", after you read this book, I can guarantee you all of your doubts will have disappeared. This book is not only a must read for libertarians, it's a must read for all Americans. "The libertarian does not deny the variety and diversity of man, he glories in it and seeks to give that diversity full expression in a world of complete freedom. And in doing so, he also brings about an enormous increase in productivity and in the living standards of everyone, an eminently 'practical' result generally scorned by true Utopians as evil 'materialism.'" 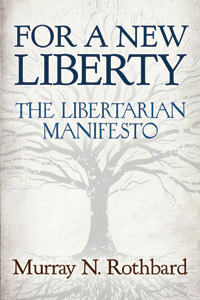 4.5" x 1.5" x 7"
An account of libertarianism from a leader in libertarian thought.